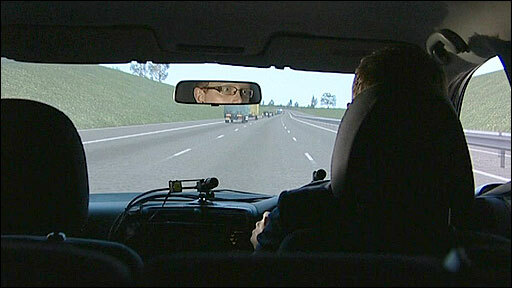 The BBC's Richard Scott took a drive in the simulator used to test people's reactions while driving on the phone. More drivers are using hand-held mobile phones than before tougher penalties were introduced two years ago, the Transport Research Laboratory has said. It found 2.6% of car drivers used hand-held phones in 2006 - when fines rose to £60 and three points could be added to licences - compared with 2.8% now. Phone-using drivers are four times more likely to crash, the TRL added. Ministers say work continues to highlight the dangers. The TRL study involved more than 14,000 vehicles. The report's authors believe there is no reason to think the picture at the 30 sites studied in London is not the same right across the UK. Researchers said the 2.6% of car drivers using hand-held mobile phones in 2006 almost halved to 1.4% the following year, when tougher penalties were brought in. The fine was doubled to £60 and three points were put on offenders' licences. But since then the number has been rising. And it is the same picture with taxi and van drivers. They too are now more likely to use a hand-held mobile phone than they were before the penalties were increased. The researchers split drivers into three age groups and found women aged 17-29 were most likely to use a hand-held mobile while driving. For men, it was the 30-59 group. "Your reaction time is likely to be slower, you're more likely to drift across into the adjacent lanes and you're less aware of what's going on around you," said Dr Nick Reed from TRL. "You're less likely to check the mirrors and know there are vehicles there, so you're at a much greater risk of having an accident." The same report shows hands-free mobile use by car drivers has risen consistently, from 1.2% in 2006 to 4.8% in 2009. But safety campaigners argue hands-free mobiles are little better because most of the problems come from the concentration needed to have a conversation while driving. Sarah Fatica, from road safety charity Brake, said the figures were a cause for concern. "It's incredibly worrying that people still don't take seriously the dangers that talking on your phone while driving pose," she said. AA President Edmund King: "If you call someone and it sounds like they're in the car, you shouldn't have that conversation"
"The biggest problem is that your concentration is impaired, and that could result in you crashing and hurting yourself, hurting somebody else, or worst of all killing somebody." 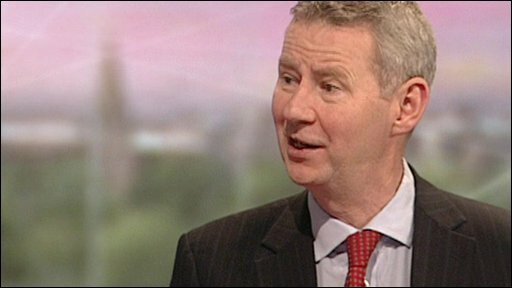 AA president Edmund King said: "I think we need more police campaigns, I think we need more publicity campaigns. "If you think back to seat-belt wearing, 'clunk, click, every trip' and the Jimmy Savile stuff way back gradually had an effect but it does take time." Kevan Craft, from Runcorn, Cheshire, suffered from whiplash after a driver who was on her mobile phone crashed into his car at 60mph. He said tougher penalties were needed. "I'd like to see a 12-month ban similar to a drink-driving offence, and where it can be proved an accident was caused by the driver being on a mobile phone, then a possible custodial sentence." Stephen Ladyman, the former transport minister who introduced the tougher penalties, said the legislation might need to be modified. "The government is probably going to have to move to a situation where it's not just the police who can issue you a fine," he said. "Perhaps they're going to have to give powers to Police Community Support Officers (PCSOs) or even traffic wardens if they spot you using your hand-held phone." In response, the Home Office said it currently had no plans to give extra powers to PCSOs. The government said in a separate statement: "We run publicity campaigns to highlight the dangers of calling or texting at the wheel. "However, some people are still needlessly risking their own lives and putting others in danger for the sake of a text or a call." In 2006, a total of 166,880 fixed penalty notices were issued for driving while using a hands-held mobile, compared with 122,000 in 2007, according to Home Office figures.